Tired of the slick, sticky feeling of sunscreen lotion? 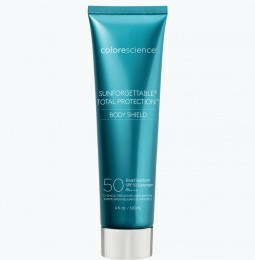 Choose Colorescience oil-free sunscreen to protect your skin with none of the grease. 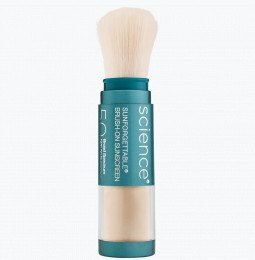 Our sunscreen powder will give you lasting coverage, resulting in a silky-smooth complexion. Why are some sunscreens oily? Many waterproof, sweatproof, and sport sunscreens contain silicone and acrylate polymers that make them water-resistant, but they’re also responsible for the gummy and greasy feeling on your skin. These polymers feel tacky, but their physical side effects can be worse—for some people, exposure can cause rashes, hives, scaling, and peeling. It can be especially difficult to find the right sunscreen if you have oily and acne-prone skin. It’s important to protect your skin from the sun, but greasy sunscreens can clog pores and increase shine. 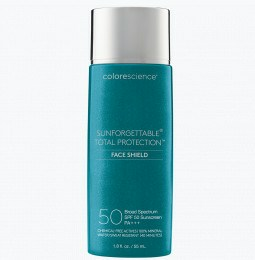 Colorescience offers sunscreen for acne prone skin that sits on top of skin and doesn’t seep into pores. Our sunscreen powders for oily faces are made of natural ingredients like zinc oxide and titanium dioxide to create a matte finish while shielding your skin from UV rays. 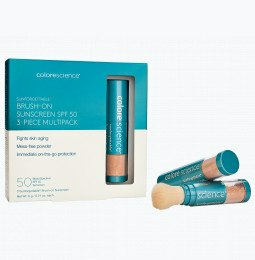 How do I apply sunscreen without ruining my makeup? Oily sunscreens create a film to repel sweat, but may also cause makeup to run and melt. In order to keep makeup in place, it’s important to pick a sunscreen that protects your skin without leaving an oily residue. 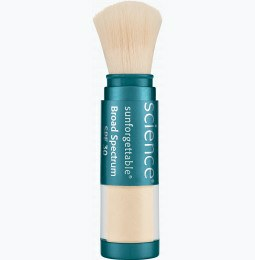 Layer our powder sunscreen beneath or over your makeup to deflect UV rays without the added shine. Pair our Loose Mineral Foundation Brush SPF 20 with our other oily skin makeup products to fill in fine lines, smooth pores, and give yourself a flawless complexion. Our loose mineral powder works well with oily, dry, sensitive, and combination skin. We offer sunscreen without oxybenzone and other harmful chemicals so you get the protection you need without harmful side effects.